"I took the picture on Jan. 23rd using a 41 cm (16 in) Meade reflector," says Drummond. "It is a stack of twenty 1 minute exposures." That much time was required for a good view of the comet's approximately 7th-magnitude coma ("coma"=cloud of gas surrounding the comet's nucleus). Lemmon's green color comes from the gases that make up its coma. Jets spewing from the comet's nucleus contain cyanogen (CN: a poisonous gas found in many comets) and diatomic carbon (C2). Both substances glow green when illuminated by sunlight in the near-vacuum of space. 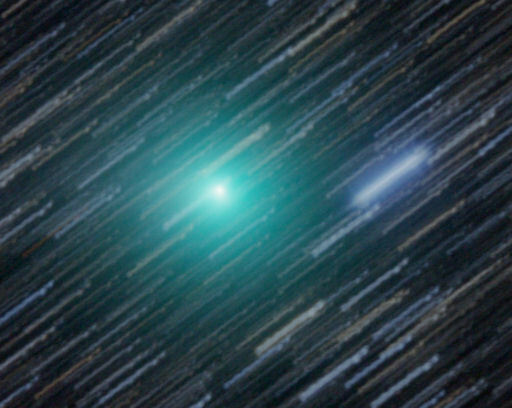 Discovered on March 23rd 2012 by the Mount Lemmon survey in Arizona, Comet Lemmon is on an elliptical orbit with a period of almost 11,000 years. This is its first visit to the inner solar system in a very long time. The comet is brightening as it approaches the sun; light curves suggest that it will reach 2nd or 3rd magnitude, similar to the stars in the Big Dipper, in late March when it approaches the sun at about the same distance as Venus (0.7 AU). Northern hemisphere observers will get their first good look at the comet in early April; until then it is a target exclusively for astronomers in the southern hemisphere. 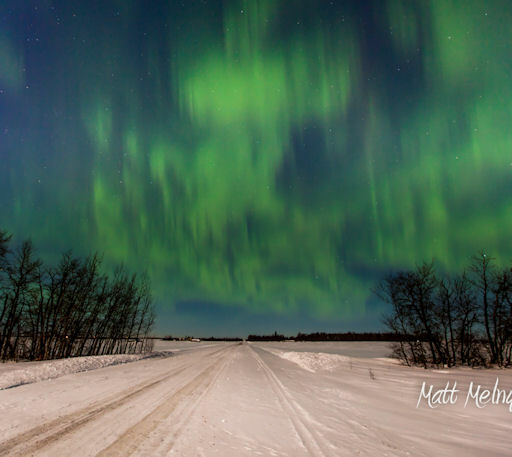 Matt Melnyk took the picture from a spot just outside Edmonton, Alberta. "The Moon was bright but it did not stop the aurora from showing!" he says. "The display started off dim then exploded into a vast array of green and purple." The chance of more geomagnetic storms tonight has dropped to only 10% as Earth exits the solar wind stream. Solar and geomagnetic activity are low. Aurora alerts: text, voice. On January 28, 2013 there were 1372 potentially hazardous asteroids.